There was a really nice guy who was a residential architectural designer who had lots of work with many customers. He had had lots of work for years. Then suddenly, in September 2008, banks and loans and mortgages crashed, and all his clients called to cancel their projects. He wondered what had just happened to the economy, and decided to find out. 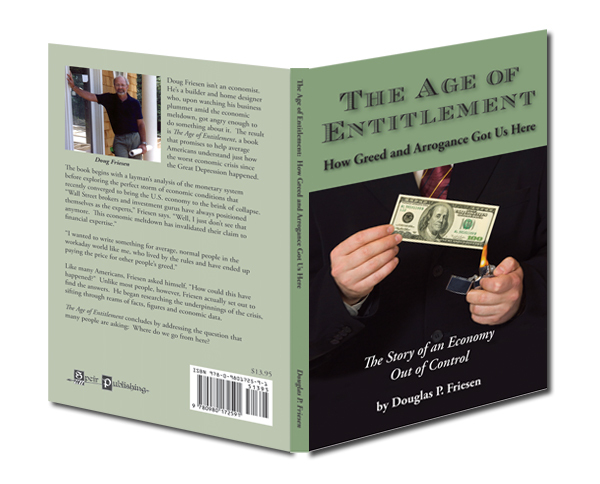 He did 800 hours of research, and ended up writing a 180-page book to explain it all from a layman‘s viewpoint. He asked me to design his book, and it was self-published He sold hundreds of copies, got rave reviews from readers, was interviewed on TV and radio shows, gave talks to groups, and wrote a blog. P.P.S. The book is really good. Before, I wouldn’t have known what a toxic asset was if I fell over it, but he explains every term and concept so well that I actually finally understand a lot about the economy now. He even ends (at my insistence!) with a chapter about what we all could do individually to help fix the mess! You can purchase it here on Amazon.com for only $13.95.